Abstract: Background – The patients hospitalized for heart failure decompensation are exposed to a high risk of events during and early after hospitalization. Elevated heart rate represents an important risk factor in this category of patients. Ivabradine is a heart rate reduction agent with benefi cial effects in chronic heart failure. Objectives – The purpose of this study was to assess the tolerability of early ivabradine administration during the vulnerable phase to unselected hospitalized heart failure patients, in conditions similar to those of current medical practice. Material and methods – A prospective observational study that included 50 consecutive patients with hospitalized systolic heart failure, sinus rhythm and heart rate >70 b/min in whom ivabradine was administered during hospitalization or early after discharge. Clinical data, echocardiography, follow-up events were recorded at baseline and after 6 months of follow-up. Results – Mean age was 60 ± 12 years, heart failure etiology was ischemic in 23 patients (46%) and nonischemic in 27 patients (54%). At baseline 26 patients were in NYHA class III and 24 patients in NYHA class IV, left ventricular ejection fraction was 26±7% and mean resting heart rate was 89±9 b/min. Ivabradine was initiated in the hospital in 35 patients (70%) and early after discharge in 15 P (30%). Concomitant heart failure therapy at baseline consisted of ACE inhibitors/ARBs in 41 patients (82%), betablockers in 46 patients (92%), furosemide in 50 patients (100%), spironolactone in 40 patients (80%), digoxin in 4 patients (8%). After 6 months of follow-up NYHA class improved signifi cantly (no patient in NYHA class IV, 14 patients in NYHA class III and 34 patients in NYHA class II), heart rate decreased signifi cantly (71±11 b/min, p <0.0001) and LVEF increased by 5% (31±8%, p=0.007). At 6 months daily ivabradine dose was 5 mg in 5 patients, 7.5 mg in 1 patient, 10 mg in 26 patients and 15 mg in 15 patients. Ivabradine treatment had to be stopped due to intolerance in 3 patients (6%), bradycardia needing dose reduction was noted in 4 patients (8%) and atrial fibrillation during follow-up occurred in 2 patients (4%). There were no signifi cant differences concerning tolerability according to the moment of ivabradine initiation. Readmissions due to heart failure aggravation were noted in 10 patients (20%), 4 deaths were recorded (8%). Conclusions – Early initiation of ivabradine therapy in patients hospitalized for decompensated heart failure,before discharge or early after discharge, is well tolerated. after discharge is well tolerated. heart rate is frequently seen in acute decompensated heart failure and may act as a compensatory mechanism or may be a contributing factor for clinical deterioration. Moreover is associated with increased myocardial work load and oxygen demand, reduced ventricular effi ciency, and impaired ventricular relaxation7. Data from the EVEREST trial have shown that heart rate at discharge and early after discharge is an important prognosis of outcome. A heart rate >75 b/min was associated with increased mortality, while there was no association with the heart rate on admission8. Decreasing the heart rate would therefore seem appropriate in order to lower the event rate. Besides betablockers, a standard therapy for heart failure patients, ivabradine, a pure sinus node inhibitor with heart rate reduction effect, has proven beneficial in chronic heart failure patients with systolic dysfunction. Ivabradine, improving ventriculo–arterial interaction caused by heart rate reduction, seems to contribute to the increase in stroke volume and improved cardiac efficiency thereby preserving cardiac output9. Because the period of hospitalization and the first month after hospitalization represent a higher risk vulnerable period, the purpose of our study was to analyze the tolerability of ivabradine initiated early in decompensated heart failure patients with sinus rhythm and increased resting heart rate. follow-up data. During follow-up readmissions for heart failure aggravation, atrial fi brillation or other cardiovascular events and deaths were recorded. If patients did not come to the follow-up visit a phone call was made to obtain data about the patient status. Data were expressed as mean ± standard deviation or percentages, comparisons between baseline and follow-up data were done with Student’s paired t test (for continuous values) or Fisher’s exact test (for categorical values). Statistical signifi cance was considered for 2-tailed p value <0.05. Statistical analysis was performed with GraphPad Prism 6 and Excel statistics. All patients gave their informed consent prior to participation into the study and the study protocol conforms to the ethical guidelines of the 1975 Declaration of Helsinki. changes before and after ivabradine administration is presented in fi gures 1 and 2. QRS duration was 124 ± 27 ms at baseline and 120 ± 26 ms at follow-up (Table 2). Concomitant heart failure therapy at baseline consisted of ACE inhibitors/ARBs in 40 patients (80%), betablockers in 46 patients (92%), furosemide in 50 patients (100%), spironolactone in 40 patients (80%), digoxin in 4 patients (8%). The type of betablockers used consisted of carvedilol (34 patients, mean dose 18.2 mg/day), bisoprolol (7 patients, mean dose 3.2 mg/day) and nebivolol (5 patients, mean dose 3.5 mg/day). Digoxin was used in patients not suitable for betablockers (COPD, low blood pressure). The comparative administration of associated drugs in the 2 groups of patients is presented in Table 3, showing a higher percentage of betablockers and spironolactone use in patients with in-hospital ivabradine administration, but without statistical significance. During follow-up ivabradine dose was increased in 19 patients. 5 patients received 5 mg/day, 1 patient received 7.5 mg/day, 26 patients received 10 mg/day and 15 patients (30%) were treated with maximal dose (15 mg/day). Doses received according to the moment of ivabradine initiation are presented in Table 4. 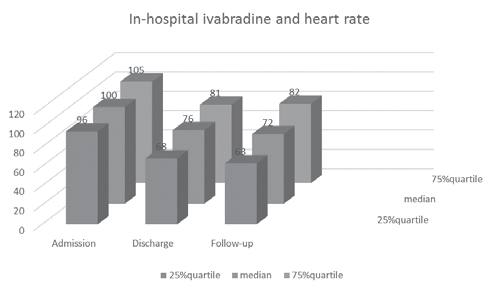 At 6 months 29 patients (82%) who received ivabradine during hospitalization received 10 or 15 mg daily, as compared to 12 patients (80%) in whom ivabradine was administered after discharge. It was possible to increase the dose of betablocker in 3 patients and in 6 patients ACE inhibitor dose was increased at the follow-up visits. Ivabradine treatment had to be stopped due to intolerance in 3 patients (6%): 2 patients presented symptomatic bradycardia <50 b/min and 1 patient presented subjective intolerance (fatigue, general discomfort – 2 weeks after discharge). In 4 patients (8%) ivabradine dose reduction during follow-up was necessary due to asymptomatic bradycardia (< 60 b/min), which was transient after dose decrease; in 1 patient the higher dose could be resumed at the next visit (Table 4). Figure 1. In-hospital ivabradine and heart rate changes. Figure 2. 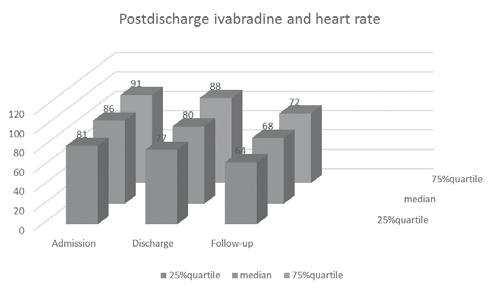 Postdischarge ivabradine and heart rate changes. All adverse events occurred after discharge, none was present during hospitalization in patients in whom ivabradine was initiated in the hospital. None of our patients presented visual symptoms. Atrial fibrillation during follow-up occurred in 2 P (4%), in 1 patient paroxysmal and in 1 patient permanent (Table 5). In these patients ivabradine was stopped and rhythm or rate control drugs (amiodarone, digoxin) were introduced. Readmissions due to HF aggravation were noted in 10 patients (20%), 1 patient needed 2 hospitalizations during follow-up. 4 deaths were recorded (8%), 2 sudden and 2 due to progressive heart failure (Table 5). biomarkers as markers of heart failure severity in all our study patients, but previous data showed that inhospital ivabradine administration decreases natriuretic peptide levels at discharge. 7. Kapoor JR, Heidenreich PA. Role of heart rate as a marker and mediator of poor outcome for patients with heart failure. Curr Heart Fail Rep 2012;9:133–138. 9. Reil JC, Tardif JC, Ford I, et al. Selective heart rate reduction with ivabradine unloads the left ventricle in heart failure patients. J Am Coll Cardiol 2013;62:1977–1985. 14. Franke J, Schmahl D, Lehrke S et al – Adjuvant use of ivabradine in acute heart failure due to myocarditis. Case Reports in Medicine Volume 2011, doi:10.1155/2011/203690. 15. Link A, Reil JC, Selejan S, Bohm M – Effect of ivabradine in dobutamine induced sinus tachycardia in a case of acute heart failure. Clinical Research in Cardiology,2009,98, 513–515. 17. Post F, Munzel T – Ivabradine—a new therapeutic option for cardiogenic shock? Herz, 2009,34,3,224–229. 18. De Ferrari GM, Mazzuero A, Agnesina L et al. – Favourable effects of heart rate reduction with intravenous administration of ivabradine in patients with advanced heart failure. Eur J Heart Failure, 2008, 10,6,550–555. 19. Heitzler VN, Pavlov M – Physiological basis of therapeutic approach to ivabradine use in new acute onset heart failure. International Journal of Clinical and Experimental Physiology 2014, 1, 1 39-43. 20. Sargento L, Satendra M, Longo S, et al. Heart rate reduction with ivabradine in patients with acute decompensated systolic heart failure. Am J Cardiovasc Drugs 2014; doi:10.1007/s40256- 013-0060-1. 21. Tardif JC, O’Meara E, Komajda M, Bohm M, Borer JS, Ford I, Tavazzi L, Swedberg K, on behalf of the SHIFT Investigators – Effects of selective heart rate reduction with ivabradine on left ventricular remodeling and function: results from the SHIFT echocardiography substudy. European Heart Journal (2011) 32, 2507–2515. 22. Reil JC, Robertson M, Ford I et al – Impact of left bundle branch block on heart rate and its relationship to treatment with ivabradine in chronic heart failure. European Journal of Heart Failure (2013) 15, 1044–1052. 23. Elder DH, Mohan M, Cochrane L et al – Characterizing Patients with Chronic Heart Failure in Community Care After Hospitalization: A Potential Role for Ivabradine. Cardiovascular Therapeutics 2015 , 33, 104–108.